Static Sag or "Race" Sag is the amount the bike compresses from fully extended, with the rider on board. 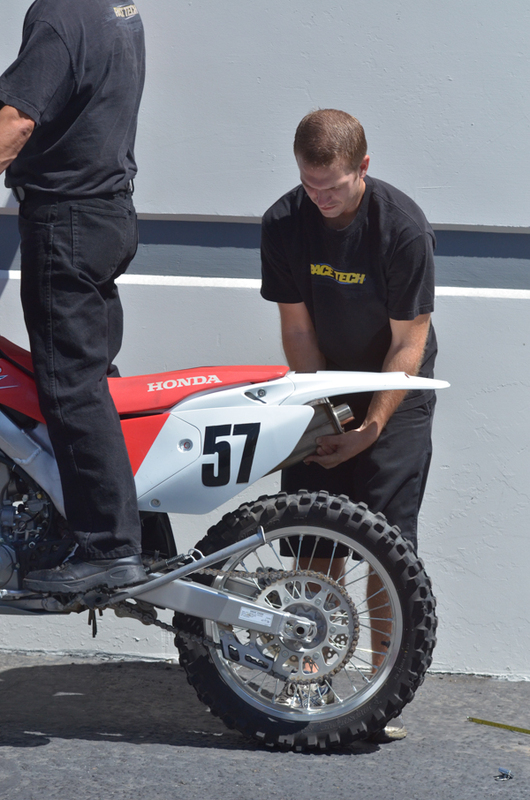 Here's how to measure it the Race Tech way. It is a little different than how you may have done it before but is more accurate and consistent. This instruction uses a Sag Master, so sag is measured directly with no subtracting required. This is why you see the tape starting from the axle instead ot the other way around. A regular tape measure can be used but it requires a little more math. If you use this method your Sag number will be consistent within /-1mm. Consult your DVS Custom Setup Sheet or Product Search for Sag guidelines. ERROR #1: If your Sag number is way too low with the recommended spring rate and preload you are probably using the wrong procedure. 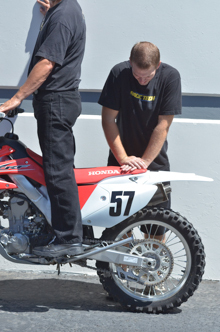 More than likely you are taking your first measurement with the bike on the ground instead of off. Using this incorrect procedure you will notice that your Sag number will not change with changes in Preload. 1- Put the bike on a stand and the wheel off the ground. 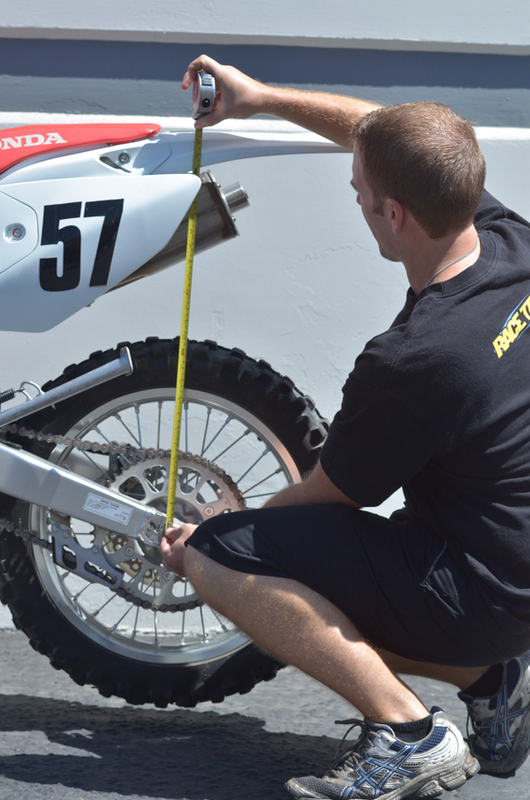 Measure the distance from the rear axle to a vertical point on the rear of the bike. ERROR #2: Not measuring vertically. 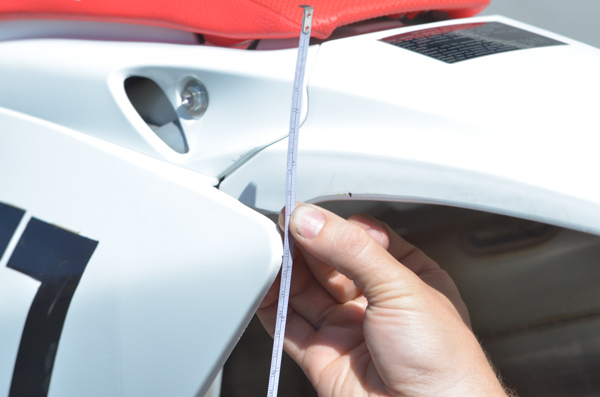 If the tape measure is angled the Sag number will be decreased dramatically (measures too low). If you don't have a Sag Master, at least use a metric tape measure. Metric is WAY easier than inches. 2- On a dirt bike put the rider on the bike in full gear (yes, I know the guy in the picture isn't wearing his) and have them stand on the pegs. The reason for standing is simple - it is consistent. Seats on dirt bikes are very long. 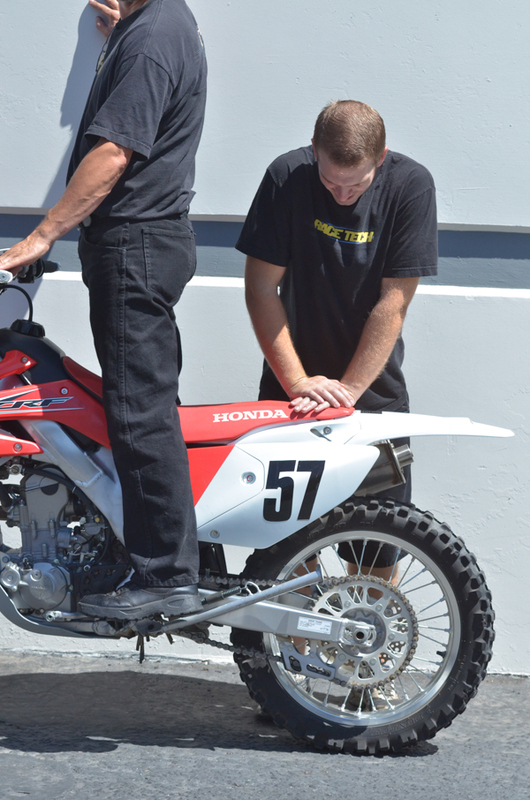 If the rider sits on the seat in different locations it will throw the measurement off. On a road bike the procedure is the same except the rider should be in standard riding postion - not standing (the position of the footpegs on different street bikes are all over the place). The best way to balance the bike is to have the rider grab onto something. It is much easier for the rider to balance the bike by himself rather than fight for balance with the person holding the bike. ERROR #3: Gripping the bike with your knees or putting weight on the bars with your hands. 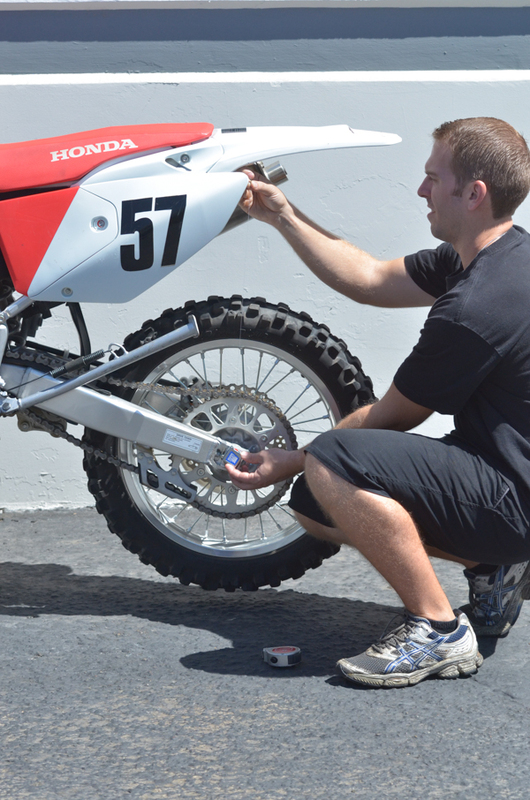 Compress the rear suspension slightly (about 20mm - 3/4") and then SLOWLY release back up - particularly at the end. 3- Measure between the same two points. If there were no friction in the linkage it would come up a bit more. 4- Lift up on the rear slightly (about 20mm) and SLOWLY release it downward - particularly at the end. If there were no friction it would continue to drop a bit more. 5- Measure between the same two points. The difference between lifting up (L2) and pushing down (L3) is caused by friction. We call this the "Stiction Zone". The greater the Stiction Zone the more friction there is. If it is more than 4 or 5mm the linkage needs attention. Sag is calculated by averaging L2 and L3 and subtracting it from fully extended. With a Sag Master there is no need to subtract since the tape was locked and zeroed at full extension. Note: FREE SAG is the amount the bike compresses with the weight of the bike only - no rider. Use the same method as outlined for Sag.